A unique fusion of rider and vehicle, the U3-X makes new strides in the advancement of human mobility. 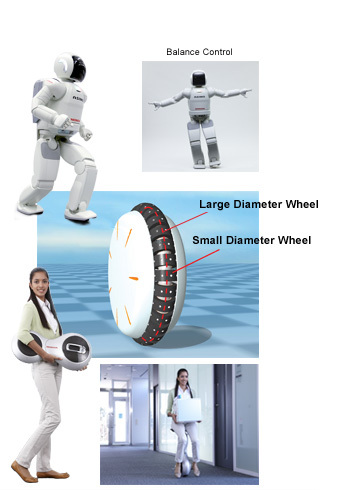 Technology developed from research into walking and balance for ASIMO provides the U3-X with balance and free movement in all directions, just as in human walking. Any change in the incline of the U3-X caused by a rider’s weight shift is analyzed to determine the rider's intention in terms of direction and speed. Precise control then returns the device to an upright position. 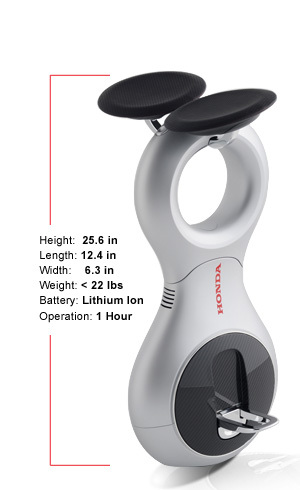 The effect is smooth, agile movements and simple operation simply by shifting your weight. The Honda Omni Traction Drive System is the world’s first wheel structure that enables movement in all directions. Multiple small-diameter motor-controlled wheels are connected in-line to form one large-diameter wheel. Rotating the large-diameter wheel moves the U3-X forward and backward, while rotating the small-diameter wheels moves it side-to-side. Combining these movements causes the U3-X to move diagonally. Weighing in at less than 22 pounds, the U3-X is lightweight and portable. The carbon fiber body-cover doubles as the support frame and also houses the foldable seat and foot rests when not in use.